Rev. W. V. Higham had ministered at Pontardulais and Llanddewi Brefi before his call to Heath in 1962. From the outset his ministry was characterised by his steadfast proclamation of the Christian gospel and a deep longing for an outpouring of God’s power in revival. Midweek meetings for Bible study and prayer provided strong support for the Sunday services, and outreach to the newly developing areas such as Lakeside was begun. With the expansion of higher education and the opening of the University Hospital of Wales in the 1960s there were good contacts with students and young people who where attending the church. This work flourished in the 1970s as many students from other countries were arriving in Cardiff, and in 1981 the church appointed a full-time worker with overseas students. 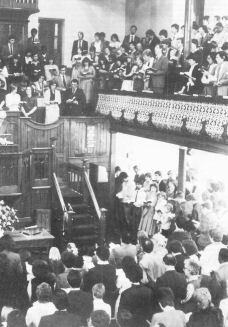 Heath Evangelical Church morning worship, 1981The evangelical witness of the church was at variance with the ecumenical trends in the 1960s and rather than compromise its doctrinal position, it was decided to secede from the Presbyterian Church of Wales in 1971. By this time the membership had risen to over 600 and the Heath Evangelical Church was formed with its own constitution and Confession of Faith. During the same period the church’s involvement in mission-work also expanded and monthly prayer meetings were arranged in support of causes in Thailand, Haiti, Cameroon, Pakistan, Eastern Europe, Wales and other missionary societies. These have continued and have been added to in later years. Although Rev. Higham suffered periods of illness he was blessed with a gift of writing hymns, some of which have become widely used and loved. He has also written helpful devotional books and been a guest preacher at many churches and conferences in this country and abroad. The annual visits of Dr. Martyn Lloyd-Jones were a great encouragement to the church, and other ministers led week-long missions at Heath in the 1980s and 1990s. Rev. 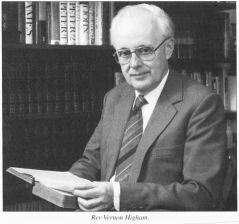 Higham’s desire for a mighty work of God in our land continued throughout his pastorate and three conferences on revival were held at Heath in the years before he retired in 2002. After an interval of two years, during which the church was grateful to God for the faithful ministry of visiting preachers, the Rev Wyn Hughes of Caergwrle accepted a call to the pastorate and was inducted in January 2005.